I know it benefits us as coaches, healers, therapists, etc…to convince you that you are broken and that the only way to put yourself back together is to hire one of us to be the glue. The problem with that approach, however is that it leaves you feeling disempowered and helpless. And it’s near impossible to make progress when you’re feeling disempowered and helpless. My approach to coaching is that, if I don’t see you completely in your power, having happy, healthy and connected relationships, then how can you realistically believe in yourself to get there? Equipping you with tools so you can improve your most important relationships (including the one with yourself)…. Can you benefit from hiring a coach that has walked through the exact same fire you’re standing in now and is equipped to guide you through it? Absolutely…when I invested in a business coach, I hired someone who had been there and done that, building a successful business on their own. We all need help once in a while and if you’ve been attempting to escape the pain or get the clarity you need on your own and not getting the results you want….perhaps it’s time to look to someone who’s been there, done that. Will you get the results you want much quicker with a coach? No doubt…we will do in weeks what it takes other approaches years to do. Do you need a coach forever? Hell, no. If I don’t equip you with the insights and tools you need so that you can walk this life and create the relationships you want on your own, then I’m not doing my job. The alternative is that you look to me – or anyone else – to tell you what to do for the rest of your life (Not a good idea…). 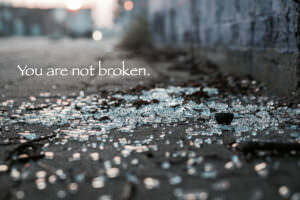 But, hear me when I tell you: You are NOT broken. You may have forgotten who you are, you may have gotten a little lost, you may have made some choices that you now question – we’ve all done that before, but none of that makes you broken. And I refuse to see you that way. Because if I jump in the pit with you, I cannot help you out.